Mrs. Smith is a 67-year-old married grandmother who has the arthritis in her knees which has started to bother her to the point that it is painful to do daily activities. At her recent physical checkup, she couldn’t climb onto the exam table because it was too high.The nurse and medical assistant couldn’t lift Mrs. Smith, who weighs 325 pounds, so she stayed in her wheelchair and could not receive her annual gynecological examination.It took four other staff members to help Mrs. Smith off the floor. She fractured a hip and had to be admitted to the hospital for surgery. The nurse suffered an injured shoulder and lower back and was out of work for a month. The scenario above illustrates how the physical environment in some outpatient settings fails those with mobility disabilities, resulting in falls and compromising quality of care. At the same time, some healthcare workers such as nurses, nursing or medical assistants, rehabilitation therapists, transporters and radiology technologists sustain injuries from manually handling and assisting patients, whether such patients have disabilities or not. Current federal law does not require medical facilities to have safe patient handling and mobility programs. However, since 2003, 11 states have enacted such rules or regulations, with 10 states requiring a comprehensive safe patient handling and mobility program in healthcare facilities. In 2013, the American Nursing Association (ANA) published “Safe Patient Handling and Mobility: Interprofessional National Standards.” This publication contains eight standards illustrating the responsibilities of healthcare organizations and healthcare workers across the continuum of care. In that same year, the Occupational Safety and Health Administration (OSHA) launched a “Worker Safety in Hospital” Web page with resources to help hospitals further enhance their safe patient handling and mobility programs. While ANA and OSHA provide standards and guidelines on the essential components of a successful safe patient handling program, healthcare workers need to understand why their current manual patient handling practices are unsafe for them and their patients, as recognition of a problem is the first step toward change. Many healthcare workers believe it is their duty to put the patient’s needs first, even if it means risking the workers’ health and safety. Therefore, it is important for healthcare workers to recognize when it is safe to lift patients manually and when it is not. 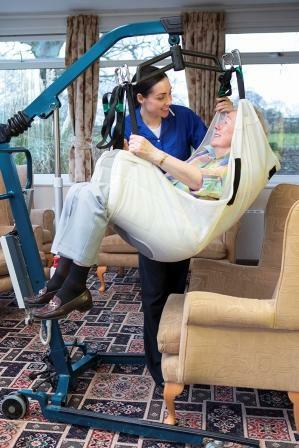 Healthcare workers need to recognize that even if a patient can assist with the lift or the transfer by bearing part of the weight, several variables remain.Therefore, if the patient has limited mobility and requires healthcare workers to bear more than 35 pounds during the patient handling task, safe patient handling and mobility equipment should be used. From a prevention perspective, if Mrs. Smith’s outpatient clinics had implemented a policy requiring workers to use safe patient handling and mobility equipment when lifting weights greater than 35 pounds during patient handling tasks, outcomes would have been different for her and her healthcare workers. If Mrs. Smith could not get on the adjustable exam table even at the lowest level, a portable or ceiling-mounted, total-assist lift could have safely transferred her on and off the exam table and wheelchair. At the colonoscopy visit, Mrs. Smith could have been lifted off the floor with a total-assist lift or an air-assisted floor transfer device instead of four staff members.Healthcare workers can use different types of devices to assist these patients throughout the clinic. If patients need help traveling from one area to another, various types of equipment can be used based on the patients’ weight and mobility status. The increased rate of obesity, the aging population and individuals with mobility disabilities can be factors that require healthcare workers to provide more assistance for patient handling tasks.Manual patient handling is the greatest risk factor for overexertion injuries in healthcare. Patients also are affected by and suffer injuries from manual handling.Now is the time to expand safe patient handling and mobility practices to outpatient settings so the Mrs. Smiths of the world can access quality care, and her healthcare workers can face minimal injury risks at their employment sites. Safe patient handling professionals, ergonomists and industrial engineers working in healthcare settings, whether they work in a region that legally mandates safe patient handling programs, can use the available resources as a guide and take their commitment to patient safety and prevention of work injuries to a more secure level.